Researchers from Karolinska Institutet, in collaboration with scientists at the University of Oslo, have used DNA origami—DNA-based design of precise nanostructures—and demonstrated the most accurate length between densely packed antigens to obtain the strongest bond to antibodies in the immune system. The research, reported in the Nature Nanotechnology journal, could be of utmost importance to the development of immunotherapy and vaccines used in the treatment of cancer. Vaccines work by using innocuous mixtures of antigens (foreign substances that activate a reaction in the immune system) from a virus, for instance, to train the immune system. Upon exposing the body subsequently to the virus, the immune system identifies the antigens carried by the virus and is able to effectively inhibit an infection. Currently, in various new vaccines, the so-called “particle display” is used, suggesting that the antigens are introduced into the body or the immune system is presented with the antigens in the form of particles, where plenty of antigens are densely packed on the surface. In certain cases, particle display of antigens works better as a vaccine in contrast to simply providing free antigens; HPV vaccine is one such example that protects against cervical cancer. Antigens are very effectively bound by antibodies, or immunoglobulins, which are the most vital part of the body’s defense against infection. An antigen can bind in each “arm” of the Y-shaped structure of the antibodies. Thus, normally two antigen molecules can be bound to each antibody molecule. In this research, the scientists analyzed the closest and the farthest distance that the antigens can be packed from each other without affecting much the potential of an antibody to bind both molecules at the same time. We have for the first time been able to accurately measure the distances between antigens that result in the best simultaneous binding of both arms of different antibodies. Distances of approximately 16 nanometres provide the strongest bond. Björn Högberg, Professor, Department of Medical Biochemistry and Biophysics, Karolinska Institutet. The study, which was led by Björn Högberg, also demonstrates that immunoglobulin M (IgM), the antibody to be first involved in an infection, has a considerably larger reach, or the potential to bind two antigens, than was considered earlier. IgM also has a considerably greater reach compared to the IgG antibodies synthesized at a later stage of an infection. The technology used by the researchers is based on a comparatively new method called DNA origami, which has been used from the year 2006. 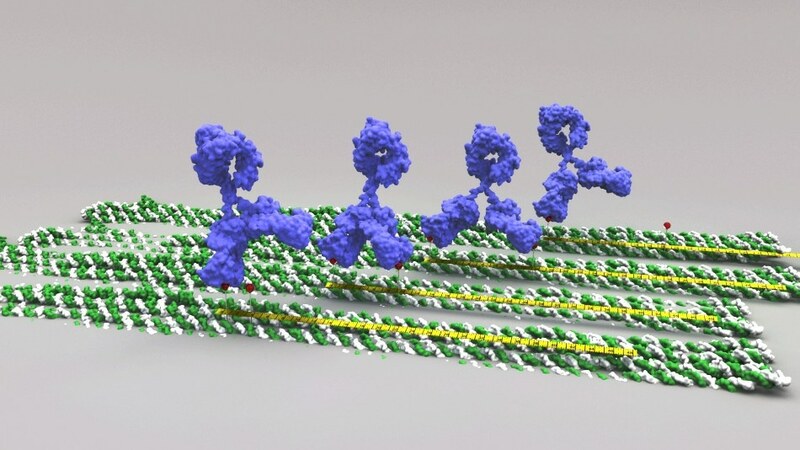 This method enables designing of precise nanostructures using DNA. Yet, researchers have learned to apply this method in biological studies only in recent years. The application used in this research has been developed anew. By putting antigens on these DNA origami structures, we can manufacture surfaces with precise distances between the antigens and then measure how different types of antibodies bind to them. Now we can measure exactly how antibodies interact with several antigens in a manner that was previously impossible. The outcomes can be applied to gain better insights into the immune response, for instance, the reason behind the effective activation of B lymphocytes, a kind of white blood cell, by particle display vaccines, as well as to produce better antibodies for immunotherapy for the treatment of cancer. The study has been performed in close partnership with the Laboratory of adaptive immunity and homeostasis headed by Jan Terje Anderson, at the University of Oslo and Oslo University Hospital. We study the relationship between the structure and function of antibodies. Such insight is important when we design the next generation of vaccines and antibodies for tailor-made treatment of serious diseases. We have long been looking for new methods that can help us get detailed insight into how different antibodies bind to the antigens. The collaboration with Björn Högberg has opened completely new doors. Jan Terje Andersen, Head, Laboratory of Adaptive Immunity and Homeostasis, University of Oslo. The Swedish Research Council, the Swedish Foundation for Strategic Research, the Knut and Alice Wallenberg Foundation, the StratRegen/Karolinska Institutet and the Research Council of Norway funded the research.